We are kicking off the 2013 holiday shopping season with a bang! What do your children have on their wish lists? A play kitchen, wagon, climber and playhouse? How about a backyard climber and patio furniture? Better yet, a swing set! My kids have a lot of the Step2 toys on their Christmas list, including a Step2 Creative Studio Art Desk. My 3 year old would love to have a pink Step2 convertible bed in her room and my husband dreams of setting up a Step2 Extreme Coaster in our backyard. There are so many great things to choose from! One lucky child is going to have their wish granted this holiday season. 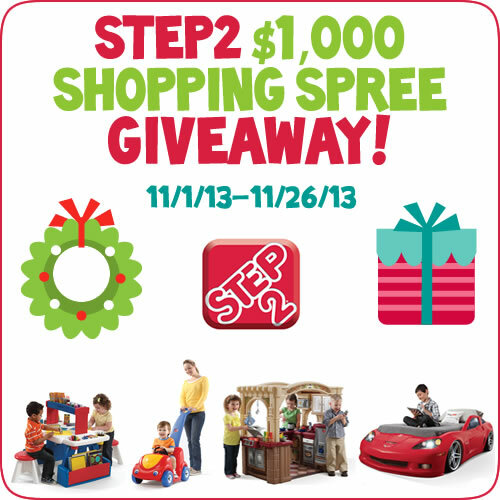 Now through November 26th, Step2 is giving one lucky reader a $1,000 shopping spree on Step2.com! That would certainly help out Santa (and mom and dad too). What would you do with a $1,000 Step2 shopping spree? Giveaway is open to residents of the 48 contiguous US states only, ages 18+. Ends 11/26/13 at 11:59 PM EST. Good Luck! ← Superman and Supergirl Halloween Costumes from Kohls – My Little Goblins!